Well, "The Beast" has given up another load of gorgeous tumbled agates. After 4 stages and 16 days, here is what we got. While we had a few pieces that had been cut previously, almost all of these were stones that we found. We noted some beautiful red and golden flame along with moss, plume, lace and fortification and a few nice pieces of jasper. We will now grade them as gem, specimen or general. The latter we put in genuine bait bags found on the beach and sell for $10 a bag (about 2 pounds) and the buyer gets to choose a specimen piece as well. The next batch will include the agate we have found at Gulliver's Cove and there will be some really nice crazy lace agate in there. If you are in the area and the open sign is out, drop by and say hi. In today's fast-paced life, most people take "destination" vacations. Get there fast, enjoy the destination and go home. Since time is so precious, travelers are wary of wasting a second on an unrewarding side trip. So you need a great reason for getting off the big highway and taking the road less traveled. I'm going to give you two. Now that the ferry has come back to Yarmouth, a lot of people are driving highway #101 to get to the Annapolis Valley and Halifax or back to Yarmouth for the ferry. Do yourself a huge favour and take exit #28 to Belliveau Cove. 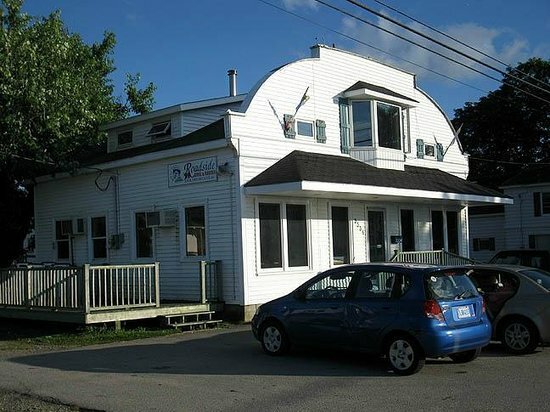 In a few miles, you will enter the French Shore- home to the Acadians and their marvelous culture and life style. If you are like me, you will feel that you have gone back in time to a more simple, gentler era where people actually care. 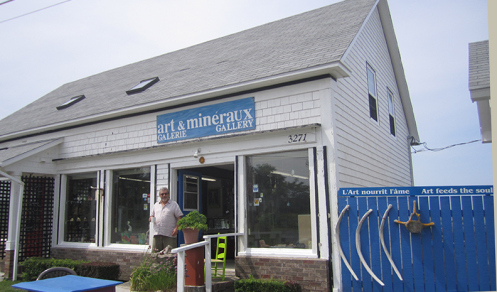 Reason #1 is Claude Chaloux and his great store- Art & Mineraux. Claude isn't a true Acadian- he was born in Quebec but he has sure picked up the life style. Like everyone in the area, he speaks perfect english and is truly hospitable. What sets him apart is his art. Claude is very much like my wife- he's great at a lot of things. 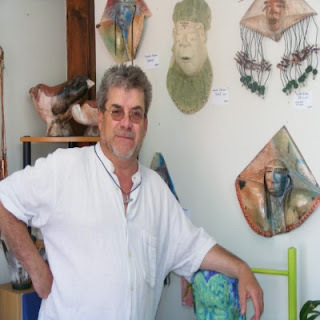 He paints, he sculpts and he creates beautiful jewelry. All Claude's art is worth the trip just to see. Art & Mineraux is a real find! Along with Claude's work, you will find pieces from other artists as well as mineral specimens and fossils from all over the world. But the real centerpiece is Claude himself- a true gentle man and font of local information. On your vacation, you only get so many meals. Reason #2, The Roadside Grill in Belliveau Cove is worthy of being one of them. Here you get it all- great food, fast, friendly service and a home style setting which again reflects gentler, simpler times. And if you are adventurous, you might want to try the crowning achievement of Acadian food. 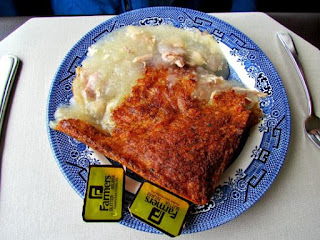 Rapure (Rappie) Pie is one of those meals you need to try at least once. My wife loves it and has become a bit of a connoisseur. In her opinion, the Rappie Pie at the Grill is at or near the top on any given day. Cross it off your bucket list. Apart from that, what's great on the menu? Easy- everything! They also have cabins and after you have tasted the food, you just might want to stay! So if you are in the area, do yourself a real favour and visit Belliveau Cove. It's not far from Hwy. 101 and I predict it will be one of the highlights of your stay in beautiful, friendly, Nova Scotia.